There are many auto focus systems built into cameras and camcorders. Conceptually, they share the same fundamentals. The following is such a scheme. 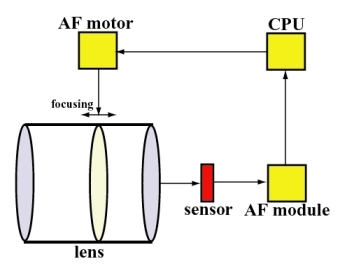 The camera lens projects the image onto the image sensor, the AF module retrieves a portion of the image for the CPU to process the contrast information, and the CPU activates the auto focus motor to move the lens for focusing based on the processing result. This process repeats until the subject is accurately focused on. There have been many auto focus methods proposed, developed, used, and discarded in the past four decades. Currently, the two most popular ones are the contrast detection method and the phase detection method. The former has been superceded by the latter; however, it is being used in many consumer level digital cameras. What Is the Contrast Detection Method? Suppose further the lens is out of focus initially. The extracted portion may be very similar to (a) below. During the focusing process, the extracted portion may go from (b) to (f), and eventually reaches a fully focused image as shown above. From these images, initially we (and the AF module) only see a very blurred image with very low contrast. As the lens moves to focus, the contrast level of the image increases. In fact, we can see some barely visible blurry lines in (d). The contrast between the dark color lines and bright color space becomes clearer in (e) and even better in (f). When the lens settles on the highest contrast image as shown above, auto focus completes. Since this method requires contrast for focusing, the scene or the area used for focusing must have a reasonable contrast. Since low light implies low contrast, one major drawback of the contrast detection method is that AF may fail in a poorly illuminated environment and one must fine a high contrast area to focus. This is a major cause of the well-known focus failure problem of many digital cameras. The contrast detection method may also be defeated by a range of subjects with contrast gradients and/or repeated patterns. If we look at the diagram in the beginning of this page, we will see at least the following components that can slow down the auto focus speed: (1), the time for the AF module to extract the portion in the image for auto focus; (2) the time for the CPU to process the contrast information; (3) the time for the CPU to instruct the motor to move the lens for focusing; and (4) the number of iterations the above steps must be repeated to get a focus lock. Item (1) would not be a major problem in general, because it only involves retrieving a portion of the pixels from the image sensor. The retrieval speed is usually dictated by the image sensor access speed. Item (2) has three major factors. First, the CPU processing speed. A slow CPU will process data slower. Second, although there are many contrast detection based systems around, they may not use the same algorithm in processing the contrast information. Efficient algorithms use less time. Third, contrast processing algorithms would usually be slower when the focus area has lower contrast. This is mainly the reason that an AF system work slower in low light and/or low contrast situation. Items (3) may be crucial. Not all motors for driving lenses for focusing are created equal. Some are faster than the others. Moreover, lens design also plays an important role. Some lenses move a shorter distance than other lenses for the same focus request. Therefore, given everything being equal, the lens that moves a shorter distance focuses faster. This is the major driving force for camera and lens makers to design internal focusing (IF) and rear focusing (RF) systems and faster motors such as Nikon's AF-S silent wave motor. In general, items (1) and (2) are electronic whose latency is generally shorter than the mechanical latencies such as moving the camera lens. Note that the situation may be worse if the lens is zoomed in because the maximum aperture may be reduced by about 1 stop (lower light, and hence lower contrast), and the focusing group of the lens may be forced to move a larger distance. Based on the above discussion, let us see the other factors that can affect AF speed. In fact, these factors can also be considered part of the four items discussed earlier. Product quality varies, and no two cameras will work exactly the same. However, the variation in AF speed should be very minimal unless you have a defective camera. The AF speed at the tele end is likely to be slower than the AF speed at the wide angle end. All zoom lenses zoom back to wide angle (i.e., shorter lens barrel), and extend to reach telephoto (i.e., longer lens barrel). Hence, the focus group of the lens will travel a shorter distance at the wide angle end than that at the telephoto end. Consequently, the AF speed at the wide angle is definitely faster than the AF speed at the telephoto end. The actual difference depends on the lens design. We also mention about that Coolpix cameras are of the variable aperture type. Therefore, the maximum aperture becomes a function of focal length. Since the lens barrel extends at the telephoto end, aperture at the long end of a lens is smaller, and, as a result, contrast may be reduced due to light loss. In some cases, the light loss will also cause the AF speed slower. The lens on a Coolpix is a vari-focal one, which means the lens does not maintain focus during zooming. In other words, if the lens is focused at a distance and then is zoomed in or out, the lens is no more focused. Thus, you need to lightly press the shutter release button to refocus in the single mode. Or, the AF system works continuously to refocus. Camera shake could also make AF speed slower in low contrast situations. Why? We mentioned earlier that the AF module extracts a portion of the image for focusing. In a low light and/or low contrast situation in which the AF speed is already slow, if camera shake does happen, the AF module may retrieve a slightly different portion for contrast processing. Consequently, the AF system will need more time to determine the contrast of the "real" area you wish to focus on, and, of course, focusing speed will be slower. In fact, if you are shooting macro, the lens may just hunt for a while and stop. So, in a low light and/or low contrast environment, using a tripod will make AF speed a little bit faster. As a consequence of the above item, a slower AF system may not be above to shooting moving subjects. We have to be very careful in saying "moving" subjects. The key is if the camera follows the moving subject (i.e., panning). For example, one can prefocus at certain point and take a shot when the moving subject passes through it. In this case, the camera does not move and does not focus on the moving subject. Instead, the camera focuses on somewhere we anticipate the subject will pass through. Therefore, as long as the prefocus step can be carried out before the moving subject arrives at the anticipated point, one will have a focused image. So, this prefocusing at an anticipated point is in general not an AF speed issue. Some people choose to show off an image taken in this way does not demonstrate if an AF system is fast or slow; it only shows that the prefocus and prediction were successful. The real challenging task is if the AF system can continually focus on, or track, a moving subject. Some cameras such as the Coolpix 5700 provide a "continuous" mode for the camera to keep focusing even when the camera is moving. However, the dynamic tracking AF capability is different because the AF system can choose the appropriate AF focus area in order to keep track the moving subject. The dynamic tracing capability is available on many mid- to high- end SLR cameras. As of this writing, the only consumer level digital camera that has this capability is the Minolta A1.